Acer has revealed its new Aspire E1 notebook series, which comes with the new generation of AMD Mainstream APU, while also kicking off its refreshed Aspire V5 notebook series. The Aspire V5 is available with AMD Elite Mobility and Elite Quad-core A-series accelerated processors. lt will be available in three sizes - 11.6-inch, 14-inch and 15.6-inch - and comes with or without touchscreen ability. 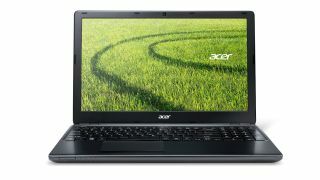 Selected models - the V5-452 - will include AMD Radeon HD8750 discrete graphics, and all come with a range of connectivity options including HDMI. The Aspire E1 notebook, meanwhile, is available in 14-inch and 15.6-inch versions, and customers will have the option of either AMD quad-core A6 or A4 accelerated processors. It's also amusingly available in either "piano black" or "clarinet black". Unfortunately, "lights-off black", "black-hole black" and "regular black" aren't available. The V5 will be available at the end of May in some European countries while the E1 is available starting immediately. However the official UK release date and prices have not yet been announced for either, though Acer has promised them very soon. Both are currently priced at €399 (about £340, US$515, AU$535) in other European countries.